There are a lot of system folders in Windows. In most cases the purpose of those folders is not known to the average user. These folders store various system information, and they do not attract anyone’s attention until they start to take up a large amount of free space. This is especially critical if the system drive is relatively small (for example SSD). 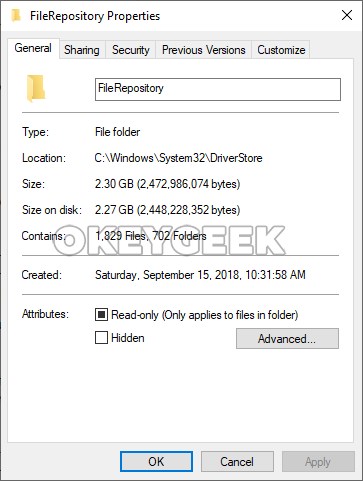 In this article, we will look at what the FileRepository folder in the System32 category of the Windows folder is responsible for and whether it can be deleted. Here, among other folders, will be FileRepository. After that you will find yourself directly in the FileRepository folder. As you can understand from the location of the FileRepository folder (which is situated in Windows) this is the system folder that is generated by default when you install the operating system. This folder is required to store drivers. That is, it contains all the drivers that have ever been installed on a computer automatically or manually. The FileRepository folder in the Windows 10 operating system is not self-cleaning by default. Accordingly, the longer the system works without reinstalling on a particular computer, the larger the folder size becomes. Information that is stored in the FileRepository folder may become quite useful in case there will be a critical error during the next update of the hardware drivers. In Windows (in the Device Manager utility) you can roll all your drivers back to the previous versions for each specific device. Simply put, all the installers of all the drivers that have ever been installed on the computer are copied to the FileRepository folder. How often user will access the contents of the FileRepository folder depends only on him. If you work on a stable version of the operating system, download all updates in time and install only the drivers released and supported by developers, it is likely that the information from the FileRepository folder will never be required. At the same time, if the computer is actively used, the size of this folder can grow up to ten gigabytes, which is a lot for small system storage devices. Considering that there are only driver installers backup files stored in the FileRepository folder, it may be concluded that nothing terrible happens in case this folder is deleted. But before sending it to the Recycle Bin, it is better to create a Windows restore point and a backup copy. By Windows means. When you will try to delete the FileRepository system folder in the standard way, you are going to see a message requesting the administrator permission. This can be done by getting the TrustedInstaller rights. With the help of third-party applications. There are many programs that allow you to delete system files in Windows, for example, this can be done through LiveDisk. But deleting the entire FileRepository folder is not the best solution. There is always a chance that during the next Windows update there will be failures in the operating system; and rolling drivers back may become quite handy in this case. That is why it is better to delete from the FileRepository folder only the outdated drivers. To do this, we recommend using the DriverStoreExplorer application, which can be downloaded for free from the Internet. This utility allows you to see which drivers are installed on your computer and remove them. Download the program and run it. 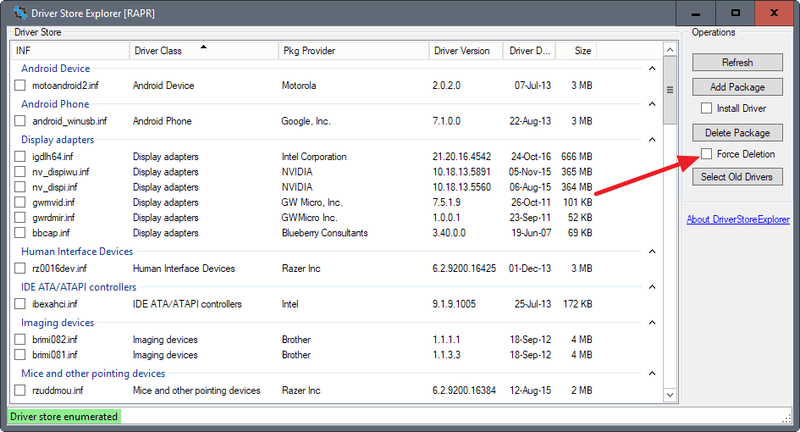 After that, click on the “Select Old Drivers” button on the right side of the application so that the program will automatically select all outdated drivers. Check the “Force Deletion” box – this is necessary for the deletion to go successfully, despite the driver lock removal system. And click “Delete Package” to delete. After that, all outdated drivers will be removed. But it is also worth noting that this application has a manual mode for removing drivers. Here you can choose which drivers should be deleted. If you know how to use it, you should be able to easily remove the drives that are not used anymore. For example, it may be the drivers of an old video card that has already been removed from the computer, or an old printer. In automatic mode, the program deletes all outdated drivers, but it cannot independently check which drivers are accessed by your computer. Accordingly, drivers from the hardware that is not already used with this computer should be removed manually.